Redux is becoming the de facto way to build React apps. And there are tons of examples that show how it’s done. But React-Redux apps have too many parts like: “Reducers”, “Actions”, “Action Creators”, “State”, “Middleware” and more). It could be overwhelming! When I started to learn it, I couldn’t find blogs that show “Which part of React Redux to build first?” or how to generally approach building any React-Redux apps. 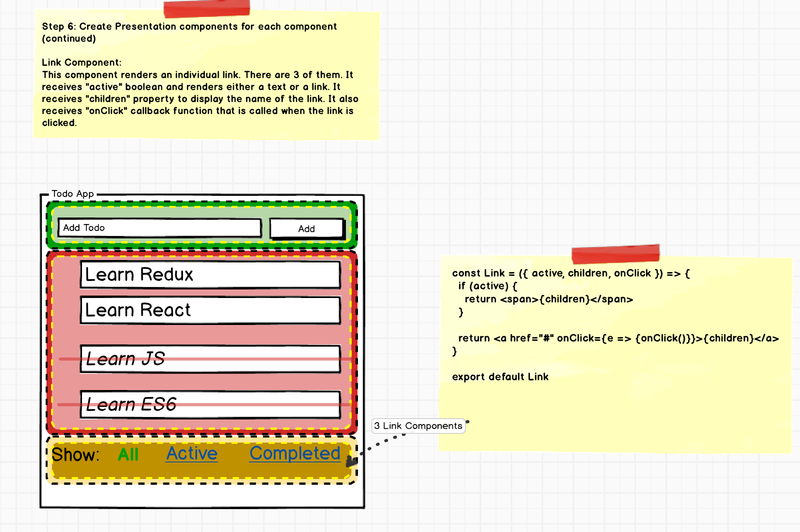 So I went through several example and blogs and came out with general steps as to how to approach building most React Redux Apps. Please Note: I am using “Mocks” to keep it at a high level and not get into the weeds. I am using the classic Todo list app as the basis for building ANY app. If your app has multiple screens, simply repeat the process for each screen. React — A JS library that helps us to divide up our app into multiple components but doesn’t clearly specify how to keep track of the data(aka State) and how to deal with all the events(aka Actions) properly. Redux — A complimentary library to React that provides a way to easily keep the data(State) and the events(Actions). 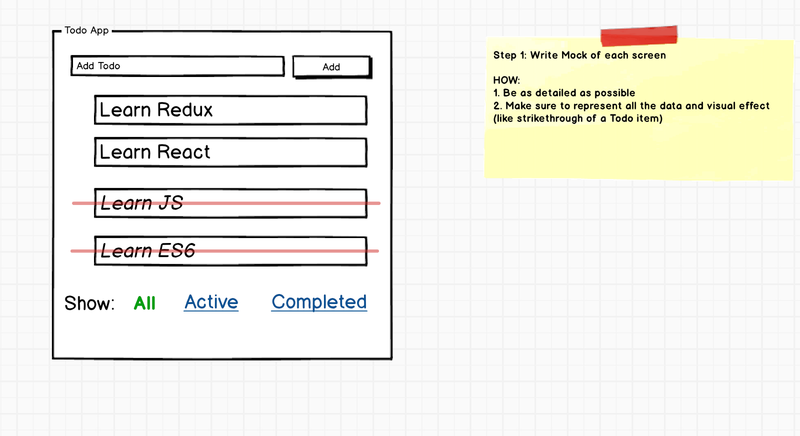 BTW, There are8 steps for a simple Todo App. The theory is that, earlier frameworks made building Todo apps simple but real apps hard. 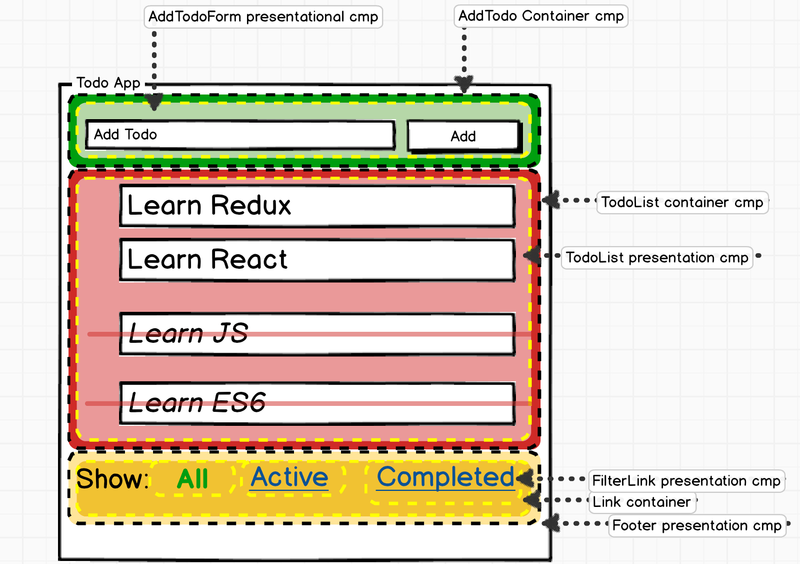 But React Redux make building Todo apps hard but real productions apps simple. 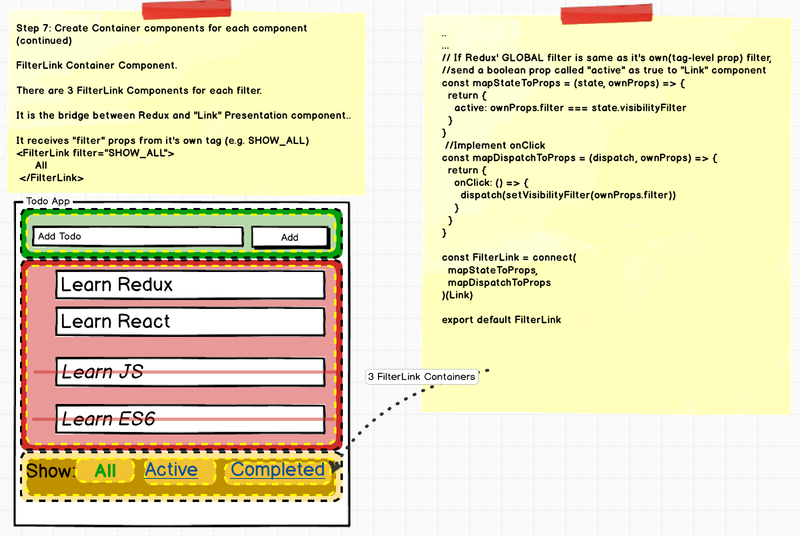 Try to divide the app into chunks of components based on their overall “purpose” of each component. 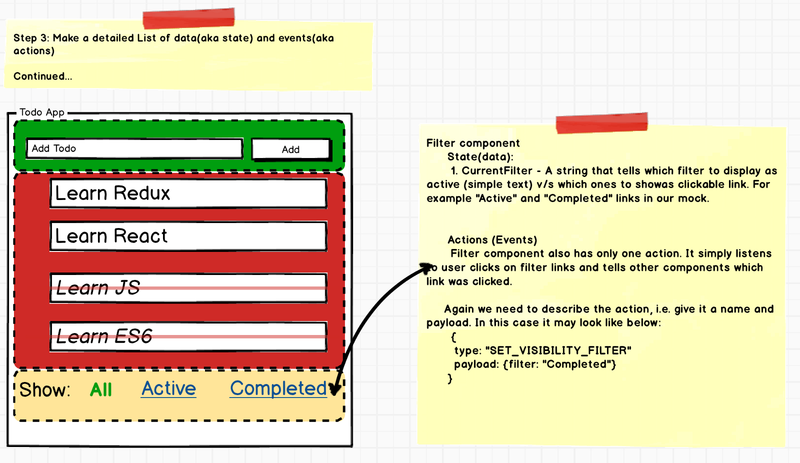 We have 3 components “AddTodo”, “TodoList” and “Filter” component. 1. Render DOM based on some data. This data is called as a“state”. 2. Listen to the user and other events and send them to JS functions. These are called “Actions”. Make sure to take a careful look at each component from STEP 2, and list of States and Actions for each one of them. 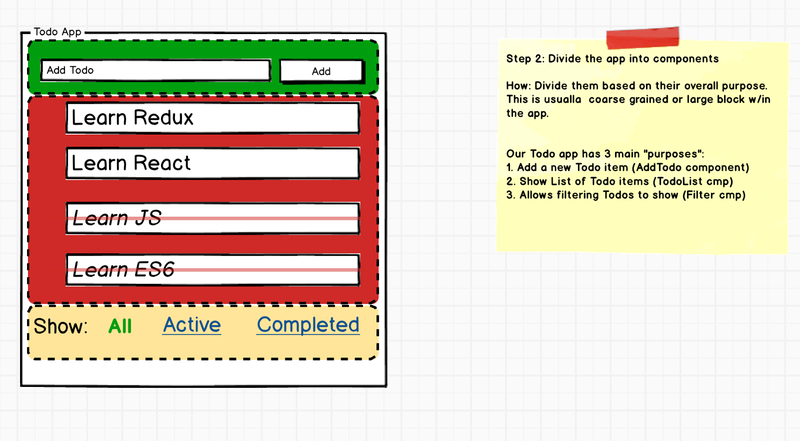 We have 3 components “AddTodo”, “TodoList” and “Filter” component. Let’s list Actions and States for each one of them. In this component, we have no state since the component look and feel doesn’t change based on any data but it needs to let other components know when the user creates a new Todo. Let’s call this action “ADD_TODO”. 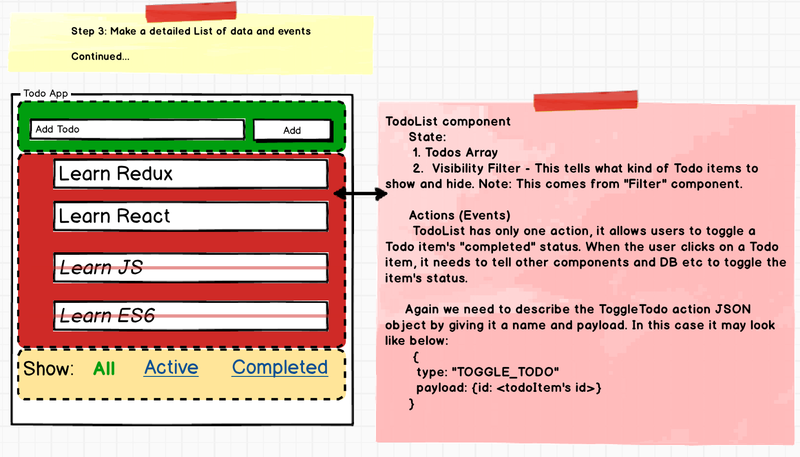 TodoList component needs an array of Todo items to render itself, so it need a state, let’s call it Todos (Array). It also needs to know which “Filter” is turned on to appropriately display (or hide) Todo items, it needs another state, let’s call it “VisibilityFilter” (boolean). Filter component renders itself as a Link or as a simple text depending on if it’s active or not. Let’s call this state as “CurrentFilter”. 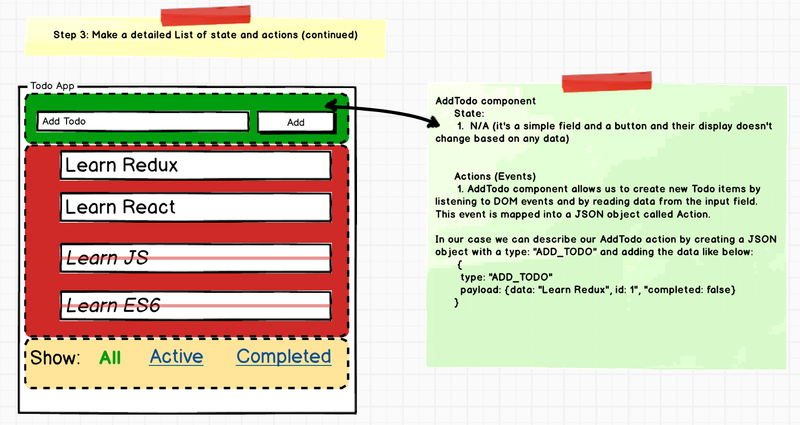 Action Creators are simple functions who job is to receive data from the DOM event, format it as a formal JSON “Action” object and return that object (aka “Action”). This helps us to formalize how the data/payload look. Further, it allows any other component in the future to also send(aka “dispatch”) these actions to others. We have total 3 actions: ADD_TODO, TOGGLE_TODO and SET_VISIBILITY_FILTER. Let’s create action creators for each one of them. //1. 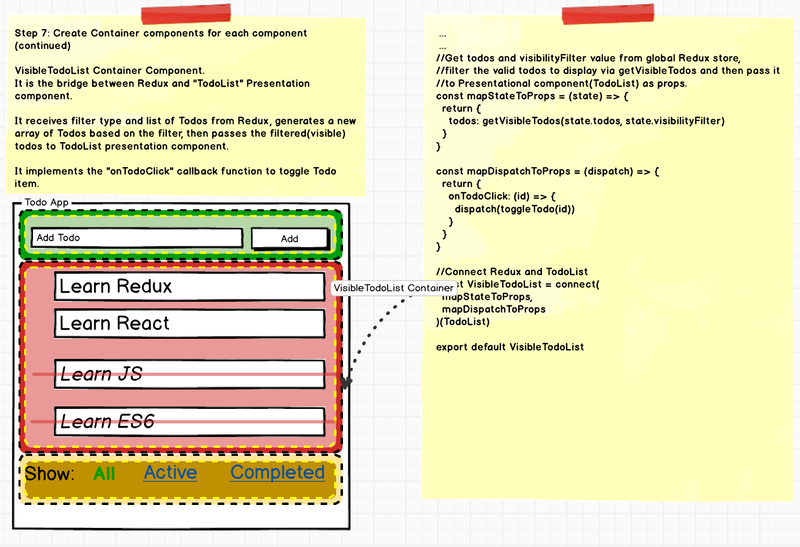 Takes the text from AddTodo field and returns proper “Action” JSON to send to other components. //2. Takes filter string and returns proper “Action” JSON object to send to other components. //3. 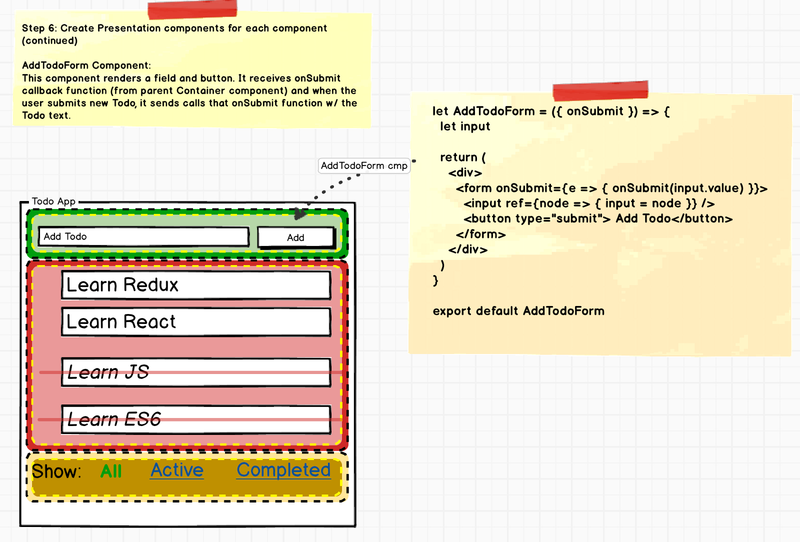 Takes Todo item’s id and returns proper “Action” JSON object to send to other components. Reducers are functions that take “state” from Redux and “action” JSON object and returns a new “state” to be stored back in Redux. 1. Reducer functions are called by the “Container” containers when there is a user action. For example the below function takes Redux’ state(an array of previous todos), and returns a **new** array of todos(new state) w/ the new Todo added if action’s type is “ADD_TODO”. Note: Some code has been stripped for brevity. Also I’m showing SET_VISIBILITY_FILTER along w/ ADD_TODO and TOGGLE_TODO for simplicity. 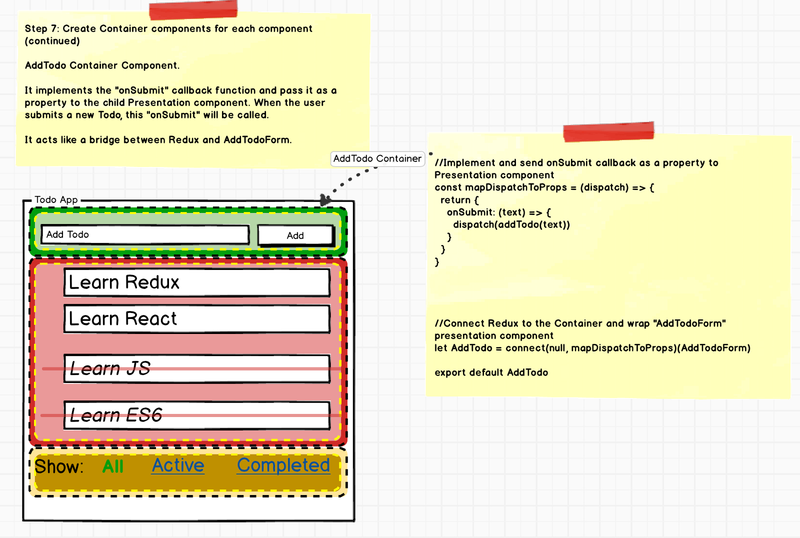 Keeping React and Redux logic inside each component can make it messy, so Redux recommends creating a dummy presentation only component called “Presentational” component and a parent wrapper component called “Container” component that deals w/ Redux, dispatch “Actions” and more. The parent Container then passes the data to the presentational component, handle events, deal with React on behalf of Presentational component. Legend: Yellow dotted lines = “Presentational” components. 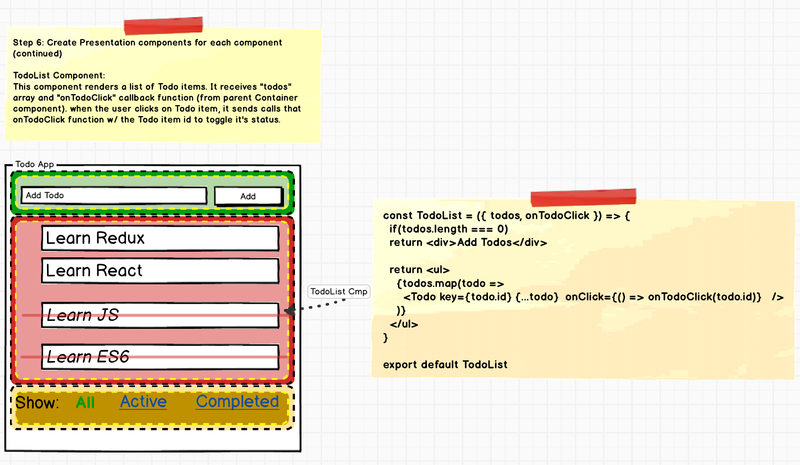 Black dotted lines = “Container” components. It’s now time for us to implement all 3 Presentational component. Note: In the actual code, Link presentational component is wrapped in “FilterLink” container component. And then 3 “FilterLink” components are then displayed inside “Footer” presentational component. It’s finally time to wire up Redux for each component! Note: In the actual code, Link presentational component is wrapped in “FilterLink” container component. And then 3 “FilterLink” components are then arranged and displayed inside “Footer” presentational component. //Create Redux Store by passing it the reducers we created earlier. document.getElementById(‘root’) //<-- Render to a div w/ id "root"